“Just in case you are in the mood to get annoyed,” read the private message from a friend of mine in Canada, the text accompanying a link. I clicked the link. 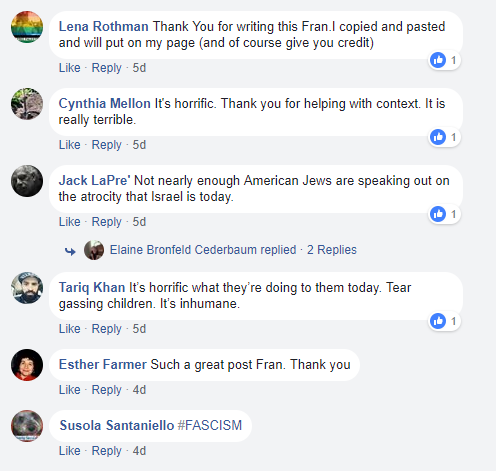 It was to a status from one Fran Miller, whose profile photo was her sweet-looking pet dog. “Please inform yourself re what's happening in Gaza. People are being MASSACRED and EXTERMINATED. Yes those words should ring for us Jewish people. Gazans live in an "open air prison," there is no hope for young people, 75% unemployment, no prospects, a few hours of electricity per day, and closed borders - they can't get out. The soil and water are poisoned b/c there is no good sewage system. The events away from the fence were festival-like, families with food and kids dancing. Of course there were some rock-throwers; they pose no imminent danger to Israeli soldiers - not a one has even been injured! These were snipers aiming slowly at people not even that close to the fence, and drones going way beyond the fence dropping tear gas and suffocating 8 month old children. Below the post one could see the enthusiastic response: 9 shares, 4 hearts, 8 angry emojis, and 23 just plain thumbs ups. 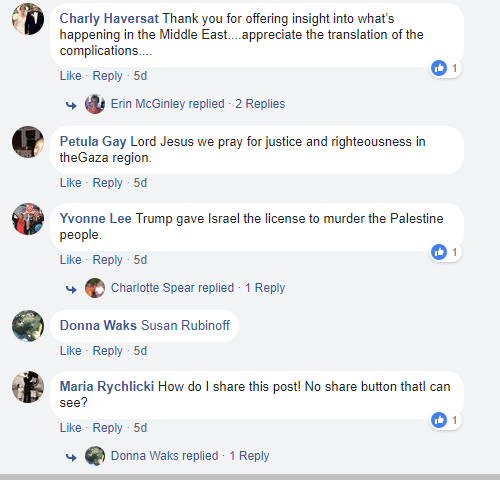 Appearing below that was a LONG thread of sycophantic comments thanking Miller and blessing Jesus for cluing them into “the truth.” Miller’s people alternatively damned Trump, and cursed Israel and its democratically elected leader, PM Benjamin Netanyahu. The words “horrific” and “inhumane” came up as did #FASCISM. Now pretty much, I’ve given up on debating random strangers on the internet. It’s just a waste of time and energy. In my experience people have lost the art of genuine debate, particularly when it comes to politics. Most people just don’t care enough to bring facts and sources to the table. It’s too much work. Instead, it’s about who can twist words into the twistiest pretzel or trip up a sparring partner with tautologies and semantics. If all these things fail, we are told that feelings matter more than facts. And there is, of course, the last refuge of any content-less debate: impugning the sources of the other. Since my friend had sent me that post, however, I stopped to consider: was my friend asking me to get involved? To say something? To shoot down these lies with facts and truth? Like I said, I’ve given up debating random strangers on the ‘net, but I’m nothing if not loyal to my friends. And if my friend needed help, I was THERE. So I took a deep breath and jumped in. Note that Miller brought in a lot of s**t in her post. Throw enough of it, some of it is bound to stick. That is how people like Miller serve to confuse the picture for their followers. They know that their readers will take away some of it: how much, it doesn’t really matter, as long as they take away something really ugly (and share it with their friends). For some, that takeaway would be: If you hate Trump, hate Israel. For others, the message received would be: Israel exterminates and massacres innocent brown people. When forced to confront the pathology of these liars, I try to keep things very basic. I work to pin them down with one or two actual facts. Which of course, leaves them with nothing left but to impugn my sources. Because that’s what they do. 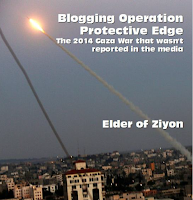 “The only thing that should concern Jewish people is the truth. Hamas admits that 50 of those killed are terrorists: https://www.jpost.com/.../50-Hamas-members-reportedly...” I wrote. “i guess we will have to agree to disagree since i believe not one thing you've written is true. 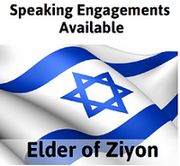 look at your sources - elder of ziyon? 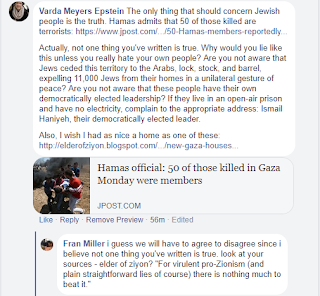 ‘For virulent pro-Zionism (and plain straightforward lies of course) there is nothing much to beat it,’” she quoted at me from the Mondoweiss commenter's comment on the right side of Elder's home page. “Fran Miller," I wrote. "All his blogs are sourced. Check the sources. All factual. If you prefer not to believe the truth, it's because you prefer the lie. Why is that? “Elder's first link, for instance, is to Maan, the Palestinian news service. http://www.maannews.net/Content.aspx?id=945598,” I wrote. I waited a bit. Miller didn’t respond. Because really, what could she say? 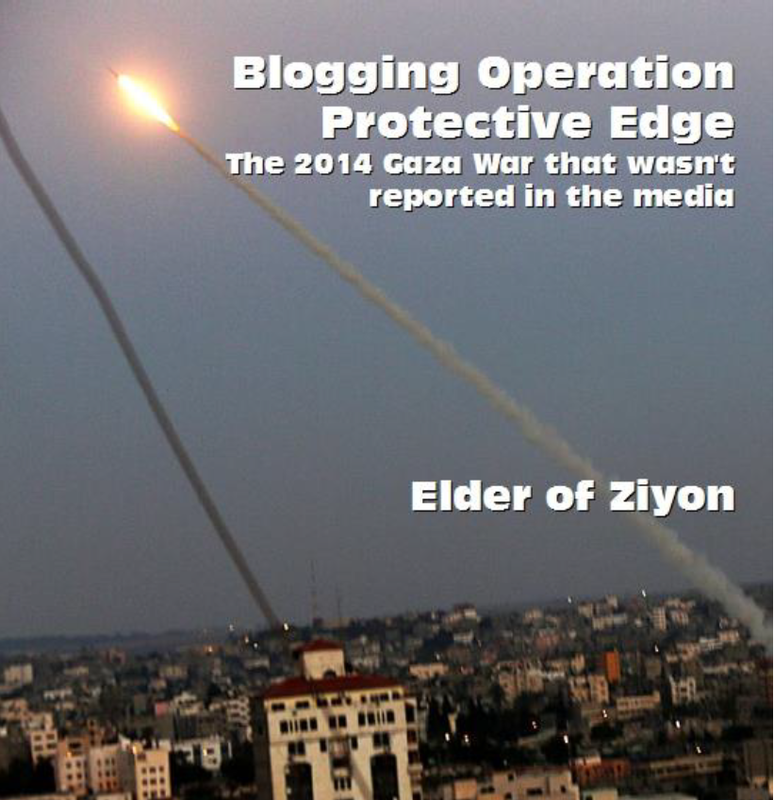 Elder had only cited Maan, the Palestinian news service. It was the same exact story; the same photos of the same gorgeous homes the wonderful German people had built for the Arabs of Gaza, only in English instead of Maan’s Arabic. 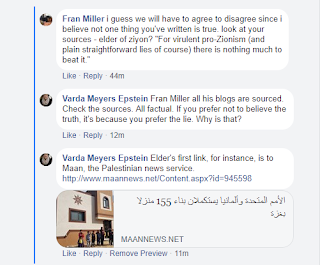 If Miller persisted in impugning my source, Elder of Ziyon, she would be impugning the Palestinian news service, Maan. And she couldn’t be seen to impugn the Palestinians, God forbid. Since I had successfully shut up her stupid, ugly trap, I decided to deliver one more broadside. “So peaceful,” I wrote, delivering the coup de grâce, this clip of Hamas Yahya Sinwar describing the true aim of "The March of Return," to tear out the hearts of the Jews. To her credit, Fran Miller didn’t block me nor resort to ad hominem insults. I went back to my friend. “Who is Fran Miller? Is she important?” I asked. 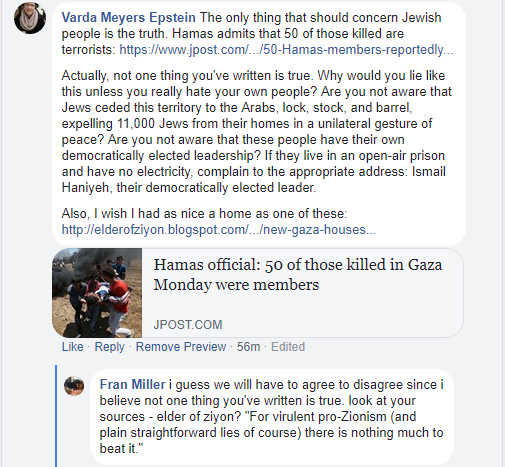 “She is with the JVP (Jewish Voice for Peace), a virulent antisemite,” said my friend. “What she does is bordering on criminality; she spreads Nazi-like propaganda while claiming to be Jewish. I have no idea if she is important, but people seem to be inspired by her and share her posts. "I have a friend in New York who has been manipulated by her," said my friend. "That really upset me." I could only hope her friend had read the exchange between me and Miller. Such debates are a dime a dozen really. 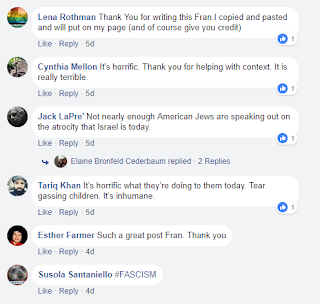 I shared it here only because clearly it was one for our side: Fran Miller got trounced by the truth. And when that happens, it’s always a win. Especially when the sycophants are watching.